What Types of Specialists Treat Ocular Hypertension? What Are Ocular Hypertension Symptoms and Signs? When Should Someone Seek Medical Care for Ocular Hypertension? What Exams and Tests Diagnose Ocular Hypertension? Are There Home Remedies for Ocular Hypertension? What Is the Treatment for Ocular Hypertension? What Medications Treat Ocular Hypertension? Is Surgery Appropriate for Ocular Hypertension? What Are the Complications of Ocular Hypertension? Is It Possible to Prevent Ocular Hypertension? What Is the Prognosis for Ocular Hypertension? Fluid (aqueous) is normally produced within the front portion of the eye and exits the eye through a drainage system located in the angle of the eye. The balance between fluid production and fluid drainage determines the pressure within the eye at any given time. An intraocular pressure of greater than 21 mm Hg as measured in one or both eyes on two or more occasions. Pressure inside the eye is measured using an instrument called a tonometer. The angle through which the intraocular fluid drains is open. An ophthalmologist (a medical doctor who specializes in eye care and surgery) assesses whether your drainage system (called the angle) is open or closed. The angle is seen using a technique called gonioscopy, in which a special contact lens is used to examine the drainage angles (or channels) in your eyes to see if they are open, narrowed, or closed. No signs of any other ocular disease are present that could contribute to elevated intraocular pressure. Some eye diseases and medications can increase the pressure inside the eye. Ocular hypertension should not be considered a disease by itself. Instead, ocular hypertension is a term that is used to describe individuals who should be observed more closely than the general population for the onset of open-angle glaucoma. Glaucoma is an eye disease in which characteristic optic nerve damage occurs, accompanied by an intraocular pressure that is relatively too high for the eye. Although most patients with glaucoma have ocular hypertension for a period of time prior to the onset of glaucoma, there are often patients who have glaucoma with normal intraocular pressures. The word tension is sometimes used as a synonym for pressure. These patients have what is termed normal tension glaucoma (NTG) or low-tension glaucoma (LTG). Another phrase that is commonly used to describe patients who may develop glaucoma in the future is glaucoma suspect. A glaucoma suspect usually has elevated intraocular pressure, but this group also includes patients with normal pressures whose optic nerve appears to be at risk for glaucomatous damage. As mentioned above, increased intraocular pressure can result from other eye conditions. However, within this article, ocular hypertension primarily refers to increased intraocular pressure with open angles and no other eye condition that causes elevated intraocular pressure, together with no optic nerve damage or visual loss related to that increase in intraocular pressure. An estimated 4 million people in the United States have glaucoma, half of whom are unaware of its presence. More than 130,000 are legally blind because of this disease. These statistics alone emphasize the need to identify and closely monitor people who are at risk of developing glaucoma, particularly those with ocular hypertension. Ocular hypertension is 10-15 times more likely to occur than primary open-angle glaucoma, a common form of glaucoma. Out of every 100 people older than 40 years of age, about 10 will have pressures higher than 21 mm Hg, but only one of those people will ultimately develop glaucoma. The ultimate goal in prevention of vision loss in glaucoma is first to identify the one out of the 10 patients with ocular hypertension who will develop glaucoma and second, to treat those and only those patients to reduce their intraocular pressure. Studies suggest that 6 million people in the United States alone, including 4%-10% of the population older than 40 years of age and 8% of those over 70, have intraocular pressures of 21 mm Hg or higher, without detectable signs of glaucomatous damage using current tests. Recent data from the Ocular Hypertension Treatment Study (OHTS) have shown that people with ocular hypertension have an average risk of 10% of developing glaucoma over five years. This risk may be decreased to 5% (a 50% decrease in risk) if eye pressure is lowered by medications or laser surgery prior to the development of glaucoma. This risk may become even smaller using newer diagnostic techniques to find subtle changes in optic nerve structure and function. This could allow treatment to start much earlier, before vision loss occurs, in certain individuals at higher risk. Future studies are under way to further assess this risk of glaucoma development. Several studies have shown the incidence of glaucomatous damage within five years in people with ocular hypertension to be about 2.6%-3% for intraocular pressures of 21-25 mm Hg, 12%-26% for intraocular pressures of 26-30 mm Hg, and approximately 42% for those higher than 30 mm Hg. People with thin corneas may be at a higher risk for glaucoma development; therefore, your ophthalmologist may use a measuring device, called a pachymeter, to determine your corneal thickness. In approximately 3% of people with ocular hypertension, the veins in the retina can become blocked (called a retinal vein occlusion), which could lead to vision loss. Because of this, keeping pressures below 25 mm Hg in all people with ocular hypertension and those who are older than 65 years of age is often suggested. Some studies have found that the average intraocular pressure in blacks is higher than in whites, while other studies have found no difference. A four-year study showed that blacks with ocular hypertension were five times more likely to develop glaucoma than whites. Findings suggest that, on average, blacks have thinner corneas, which may account for this increased likelihood to develop glaucoma, as a thinner cornea may cause pressure measurements in the office to be falsely low. In addition, blacks are considered to have a three to four times greater risk of developing primary open-angle glaucoma. They are also believed to be more likely to have optic nerve damage. Another way to think of high pressure inside the eye is to imagine a closed, nonexpandable water container. The more water that is put into the container, the higher the pressure inside the container. The same situation exists with too much fluid inside the eye -- the more fluid, the higher the pressure. 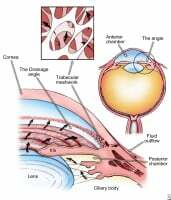 The optic nerve in the eye can be damaged by too high of a pressure. Ophthalmologists are medical doctors who have specialized in the diagnosis and medical and surgical treatment of eye disease. Ophthalmologists diagnose ocular hypertension, evaluate patients with ocular hypertension and treat ocular hypertension, when necessary. Regular eye examinations with an ophthalmologist are important to screen for ocular hypertension and primary open-angle glaucoma. In particular, regular eye examinations are critical for those people who are at high risk, such as blacks and elderly persons. For people without any symptoms and who are aged 40 years and younger, screenings should be performed at least every three to five years. Screenings should be conducted more often if the person is black or older than 40 years. For people with multiple risk factors for glaucoma, evaluation/monitoring should be performed on an even more frequent basis. Your initial visit to the ophthalmologist is extremely important in the evaluation of ocular hypertension to detect glaucoma or other ocular diseases that could be causing elevated intraocular pressure (called secondary glaucoma). Your visual acuity, which refers to how well you can see an object, is initially assessed. Your ophthalmologist determines your visual acuity by having you read letters from across a room using an eye chart. This is usually done with the glasses that best correct your vision. Tonometry is a method used to measure the pressure inside the eye. Measurements are taken for both eyes on two to three occasions prior to making a definite diagnosis of ocular hypertension. Because intraocular pressure varies from hour to hour in any individual, measurements may be taken at different times of day (for example, morning and night). A difference in pressure between the two eyes of 3 mm Hg or more may indicate that additional evaluation is necessary. Early primary open-angle glaucoma is very likely if the intraocular pressure is steadily increasing. 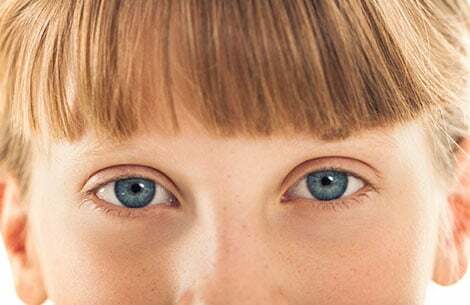 Each optic nerve is examined for any damage or abnormalities; this may require dilation of the pupils with eyedrops to ensure an adequate examination of the optic nerves. 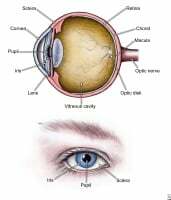 A normal optic nerve has a visible optic nerve excavation or cup. Large optic nerve cups, asymmetry of cups between the two optic nerves, or progressive enlargement of the cup can be indicative of glaucomatous change. Fundus photographs, which are pictures of your optic disk (the front surface of your optic nerve), are taken for future reference and comparison. Visual field testing checks your peripheral (or side) vision, typically by using an automated visual field machine. This test is done to rule out any visual field defects due to glaucoma. Visual field testing may need to be repeated. If there is a low risk of glaucomatous damage, then the test may be performed only once a year. If there is a high risk of glaucomatous damage, then the test may be performed as frequently as every two months. Imaging of the optic nerve and the nerve fiber layer and ganglion cell layers of the retina using optical coherence tomography (OCT) is a newer technique that is quick, painless, and objective. This can discover early changes in structure, which may indicate that treatment of ocular hypertension is necessary to prevent glaucoma. If your ophthalmologist prescribes medicines (see Medical Treatment and Medications) to help in lowering the pressure inside your eye, properly applying the medication and complying with your doctor’s instructions are very important. Not doing so could result in a further increase in intraocular pressure that can lead to optic nerve damage and permanent vision loss (for example, glaucoma). The goal of medical treatment is to reduce the pressure before it causes glaucomatous loss of vision. Medical treatment is always initiated for those people who are believed to be at the greatest risk for developing glaucoma and for those with signs of optic nerve damage. Some ophthalmologists treat all elevated intraocular pressures of higher than 21 mm Hg with topical medicines. Some do not medically treat a patient unless there is evidence of early optic nerve damage, as documented by changes in the appearance of the optic nerve, visual field loss, or OCT abnormalities. Most ophthalmologists treat patients if pressures are consistently higher than 28-30 mm Hg because of the high risk of optic nerve damage. If you are experiencing symptoms like halos, blurred vision, or pain or if your intraocular pressure has recently increased and then continues to increase on subsequent visits, your ophthalmologist will most likely start medical treatment. Your intraocular pressure is evaluated periodically. One guideline to how often your intraocular pressure is checked (if there is no evidence of optic nerve structural damage) is shown below. If your intraocular pressure is 28 mm Hg or higher, you are usually treated with medicines. After a week to a month of taking the drug, you have a follow-up visit with your ophthalmologist to see if the medicine is lowering the pressure and that there are no side effects. If the drug is working, then follow-up visits are scheduled every three to four months. If your intraocular pressure is 26-27 mm Hg, the pressure is rechecked in a few weeks after your initial visit. On your second visit, if the pressure is still within 3 mm Hg of the reading at the initial visit, then follow-up visits are scheduled every three to four months. If the pressure is lower on your second visit, then the length of time between follow-up visits is longer and is determined by your ophthalmologist. At least once a year, visual field testing is done and your optic nerve is examined. If your intraocular pressure is 22-25 mm Hg, the pressure is rechecked in two to three months. At the second visit, if the pressure is still within 3 mm Hg of the reading at the initial visit, then your next visit is in six months and includes visual field testing and an optic nerve examination. Testing is repeated at least yearly. Those who are felt to be at risk for normal tension glaucoma or low-tension glaucoma based on the appearance of their optic nerves require frequent intraocular pressure measurements despite having normal intraocular pressures. If a visual field defect is found during a visual field test, repeat (possibly multiple) examinations are performed during future office visits. A glaucomatous visual field defect indicates that you have glaucoma, not ocular hypertension. It is important for you to do your best when taking the visual field test, as it may determine whether or not you have to start on medications to lower your eye pressure. If you get tired during a visual field test, make sure to tell the technician to pause the test so you can rest. That way, a more accurate visual field test can be obtained. A gonioscopy is repeated at intervals if your intraocular pressure significantly increases or if you are being treated with miotics (a type of glaucoma medication). Optical coherence tomographic (OCT) imaging may be done yearly or more frequently to objectively document optic nerve and retinal structural changes. The ideal drug for treatment of ocular hypertension should effectively lower intraocular pressure, prevent damage to the optic nerve, have no side effects, and be inexpensive with once-a-day dosing; however, no medicine possesses all of the above. When choosing a medicine for you, your ophthalmologist prioritizes these qualities based on your specific needs. Medications, usually in the form of medicated eyedrops, are prescribed to help lower increased intraocular pressure. Sometimes, more than one type of medicine is needed. See Understanding Glaucoma Medications. Initially, your ophthalmologist might have you use the eyedrops in only one eye to see how effective the drug is in lowering the pressure inside your eye. If it is effective, then your doctor will most likely have you use the eyedrops in both eyes, if both have ocular hypertension that is best treated. See How to Instill Your Eyedrops. Once a medicine is prescribed, you have regular follow-up visits with your ophthalmologist. The first follow-up visit is usually one to five weeks after beginning the medicine. Your pressures are checked to ensure the drug is helping to lower your intraocular pressure. If the drug is working and is not causing any side effects, then it is continued and you are reevaluated one to four months later. If the drug is not helping to lower your intraocular pressure, then you will stop taking that drug and a new drug will be prescribed. Your ophthalmologist may schedule your follow-up visits in accordance with your risk of developing glaucomatous changes. Generally, if the pressure inside the eye cannot be lowered with one or two different eyedrops, your ophthalmologist will discuss the appropriate next steps in your treatment plan. Laser and surgical therapy are not generally used to treat ocular hypertension because the risks associated with these therapies are higher than the actual risk of developing glaucomatous damage from ocular hypertension. However, if you cannot tolerate your eye medications, laser surgery could be an option, and you should discuss this therapy with your ophthalmologist. The only important complication of ocular hypertension is the progression to primary open-angle glaucoma. This progression is, by definition, changes in optic nerve structure or function, as measured by visual field changes, OCT changes, or alterations in the appearance of the optic nerve. Treatment of ocular hypertension should ideally occur prior to the progression to glaucoma. Treating all patients with ocular hypertension with drugs to lower intraocular pressure does not provide a good risk to benefit ratio, since only 10% of patients with ocular hypertension will develop glaucoma within five years. In other words, if one were to treat everyone with ocular hypertension for five years, 90% of patients treated would derive no benefit from the intervention. Depending on the amount of optic nerve damage and the level of intraocular pressure control, people with ocular hypertension that has progressed to open-angle glaucoma or those who are at high risk for the development of glaucoma may need to be seen from every two months to yearly, even sooner if the pressures are not being adequately controlled. Ocular hypertension cannot be prevented, but through regular eye examinations with an ophthalmologist, its progression to glaucoma often can be prevented. The prognosis is good for people with ocular hypertension. With careful follow-up care and compliance with medical treatment, if indicated, most people with ocular hypertension do not progress to primary open-angle glaucoma, and they retain good vision throughout their lifetime. With poor control of elevated intraocular pressure, continuing changes to the optic nerve that could lead to glaucoma might occur. "Understanding and Living with Glaucoma: A Reference Guide for People with Glaucoma and Their Families," Glaucoma Research Foundation, 800-826-6693. "Glaucoma Patient Resource: Living More Comfortably with Glaucoma," Prevent Blindness America, 800-331-2020. American Academy of Ophthalmology. "Primary Open-Angle Glaucoma Suspect PPP - 2015." AAO PPP Glaucoma Panel, Hoskins Center for Quality Eye Care. Nov. 2015. <http://www.aao.org/preferred-practice-pattern/primary-open-angle-glaucoma-suspect-ppp-2015>. Kass, Michael A., et al. "The Ocular Hypertension Treatment Study: A Randomized Trial Determines That Topical Ocular Hypotensive Medication Delays or Prevents the Onset of Primary Open-Angle Glaucoma." Arch Ophthalmol 120.6 (2002): 701-713. What treatment has been effective for your ocular hypertension? Please describe your experience with ocular hypertension.